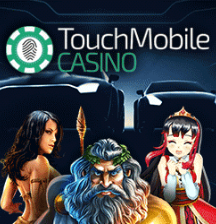 Unfortunately there is no promotional scheme available on Touch Mobile Casino to assist us in advertising the site. As such we have provided you with an alternative called Dazzle Casino, which is an impressive gaming site offering a great choice for any type of player. The use of online mobile gaming is on the rise and if you’re anything like Place a Bet Online, you’re keen to find the best new sites offering everything you need. Well we think we’ve found it with a site launched through Nektan called Touch Mobile Casino, who offer a huge range of games, bonuses and best of all the Boku pay by mobile method. If you’re looking for high quality graphics and sound then check out Touch Mobile Casino’s slot and casino games. With some of the top reels around including Mayan Marvels and Cave Raiders, plus your favourite casino games such as Blackjack and Roulette; your every need is catered for. Of course the sites name is a clear giveaway that you can access them on mobile and tablet devices. All you need is an iOS, Android mobile or smartphone and you’ll hold incredible entertainment in the palm of your hand. •	Accepts deposit by Boku (mobile billing). Bonuses aren’t merely for the new players, because Touch Mobile Casino offer a number of weekly and monthly promotions. You could earn anything from cash back and spins, to extra special prizes; now who doesn’t like the sound of that? Touch Mobile Casino love to reward their loyal gamers and as such offer the amazing Privileged Scheme. Unfortunately it’s invite only, but if you want to be part of the club then contact them via email. Privileged members can enjoy a variety of extras including cashback offers, weekly bonuses, deposit rewards and spins. If you’re anything like us, then you’ll enjoy keeping up to date on the latest news via social media pages. So check out Touch Mobile Casino on Facebook, Twitter and Google+ to discover future game launches and exciting promotions. Should you have any questions or problems we recommend checking out the Touch Mobile Casino FAQ section, which provides an extensive list of answers to more popular queries. If you need to contact a representative then you can email, telephone or write; full details are provided on the site. If you’ve never heard of mobile billing on casino, then are we about to bring you some amazing news. Boku is the option of adding any gaming credit to your mobile phone bill and paying for the credit when the bill comes through. To deposit you only need to provide your 11 digit mobile number and verify your acceptance of this method of banking. There tends to be a limit on the amount you can initially deposit, but this will increase over time. Boku is fast becoming the most popular method of banking online, which is understandable because you’ll not only have increased financial security; you’ll also be able to play even when the pennies are a little low. If you’re looking for a sleek and professional gaming site, then look no further than Touch Mobile Casino and claim the generous cash match bonuses.